Like everything: it all starts with an idea. In this case an update for Vitamins 101. An idea for adding new features to it, like what about a compare option? Ok, I can do that. What about some wiki info? Ok I can do that. What about a DRI table? Ok, I can do that. What about a conversion table? Ok, I can do…no wait a moment… I already did that. Next question: where to put all this? A slide in table with buttons for all those option? A toolbar at the bottom? One button in the navigation bar that calls up a popover menu? A menu that comes up with a gesture? Those are all possibilities. I guess it all depends on the taste and personal preferences. But I chose the separate button options…or more I started drawing a general layout of what I got from my previous update. Start at what you have. And from there I started to add the things I want. Draw a button there…and add an arrow. An new interface (which is just another square drawing). Put in some scribbles. No need for fancy things. Because it’s just me. 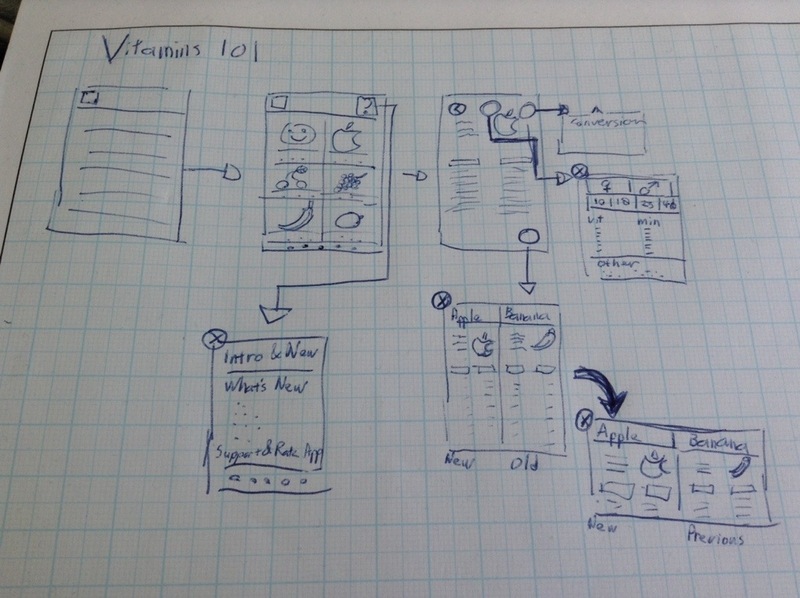 I don’t have an independent developer who needs to read my scribbles & decipher the things I want. But sometimes I do need to switch between thought processes. Design issues in layout. I want it t look like this. But then the programmer in me thinks no… I can’t do that, it will lead to a crash. Or the Apple Human Interface Guidelines will reject that straight away. Yeah there is something like that. Anyways, where was I? The creative process starts with an idea. And from there…it all depends on the person. I for one have to put it on paper first and visualize it in my mind. When I have the general picture. Then the coding starts. Sometimes fast and easy to execute. And sometimes painful with lots of crashes & error messages. Sigh…back to looking up through code examples and libraries. And the painful feeling man I don’t know anything. I don’t understand it. Why can’t I do it in one try? So needless to say lots of negative feelings. And some inner screaming. Arghh…. But why do you keep or choose this line of work? Ehm…don’t know. But one thing is for sure when I do find the answer I’ll let you know. Live is full with ups and downs. Negative feelings…and positive feelings. All I can hope that it balances out in the end. Anyways enough of my random thoughts. 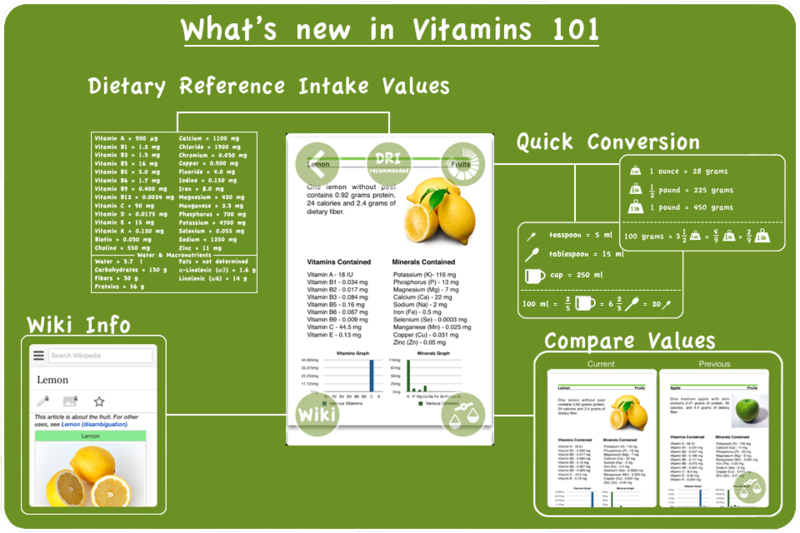 The update for Vitamins 101 is done. It’s at version 2.4 now. Let me know what you think….